These are inspired by Chocolate-Covered Katie’s Healthy Deep-Dish Cookie Pie. I’ve made some tweaks to her recipe and halved it (it’s just not smart for me to have more than this amount in my house at a given time!). These are incredibly gooey and delicious and a total sneak for people who are leery of “weird, healthy food” (I get this line a lot at my own house). I’ve taken them to work and to a party. Everyone who tried tried them said they never would have guessed that the primary ingredients are garbanzo beans and oatmeal. Stir in chips, and pour into a small oiled pan (I used a small pie plate; a double batch fits nicely in a 9×13 Pyrex baking dish). Bake at 350F for 35-40 minutes. Let stand at least 10 minutes before removing from the pan. Cut yourself a mammoth slice and enjoy! Once they have cooled, I store them in the fridge. When hot, these would be fabulous with your ice cream of choice (dairy or non-dairy) and chocolate sauce. This morning, the cooled cookie bars had a melt-in-my-mouth fudgy consistency. Divine. And I didn’t even feel guilty about eating one for breakfast. I plan to play with this recipe as a base for breakfast bars with add-ins of dried fruit, chopped nuts, and coconut flakes. I think a big batch would freeze well individually wrapped and would make a great breakfast go-to on rushed mornings. I’ll keep you posted. 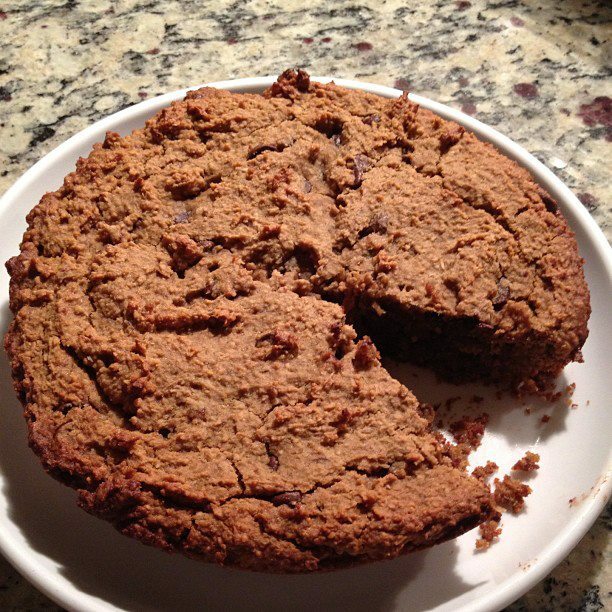 This entry was posted in gluten-free, recipes, weekend baker and tagged agave, chocolate, dairy-free, dessert, gluten-free, healthy, sucanat by Jen. Bookmark the permalink. These are so delicious! Hoping to sample them in the office Monday. I made these gooey cookies last week and they’re fantastic! There’s something about the texture that’s addicting, and the low sugar content makes the chocolate flavor explode in your mouth. A note of warning: don’t smell the dough. For whatever reason it smells, well, not so good. But not to worry, it smells good after it’s baked. Enjoy! !